There's something exciting about discovering a new series that already has several books out. No anxiously awaiting for the next book to be released - it's already been published and if you want to go on a glom - you can! That's how I feel about Harry Connolly's Twenty Palaces series. I'd never paid much attention to the series before. I thought it was an action/crime drama or something but at Comic Con, I saw it displayed on the Del Ray table with all the other urban fantasy and took a closer look. I walked out of there with a copy and I'm glad I did. Blurb: Ray Lilly is living on borrowed time. He’s the driver for Annalise Powliss, a high-ranking member of the Twenty Palace Society, a group of sorcerers devoted to hunting down and executing rogue magicians. But because Ray betrayed her once, Annalise is looking for an excuse to kill him–or let someone else do the job. Unfortunately for both of them, Annalise’s next mission goes wrong, leaving her critically injured. With the little magic he controls, Ray must complete her assignment alone. Not only does he have to stop a sorcerer who’s sacrificing dozens of innocent lives in exchange for supernatural power, he must find–and destroy–the source of that inhuman magic. This is a tightly paced story with some sharp writing. Well-crafted and plenty of action. I was impressed with how vividly drawn the two main characters were from the get go, done in a spare style that avoided info dumping and kept the story moving at a brisk pace yet managed to animate the characters distinctly without an overabundance of description. 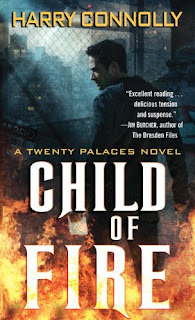 Listed as an urban paranormal, in some ways, Child of Fire read more like horror. Recently released ex-con Ray Lilly and his new boss Annalise are on their way to the small town of Hammer Bay. Something is killing the children of the town in a way that is both gruesome and horrific. The victims burst into flame, burning until all that is left is a mass of squiggling, squirming, white worms which burrow off into the ground. It’s not often that you read something like that – especially when it involves children - but don’t worry, it doesn’t actually hurt the victims. One child even laughs, as if being tickled by the flames... before his head bursts apart. As if that wasn’t strange enough, the death of each victim eradicates all memory of them from the townsfolk. It is as if the children never existed. Something evil is going on and it is up to Annalise, as a member of the Twenty Palaces Society, to kill the perpetrators. (Not stop but kill. Annalise is totally badass.) When Annalise is magically injured, Ray must step in to solve the mystery while keeping both himself and Annalise alive. Ray is one of my new favorite characters. A former conman and all around tough guy, Ray categorizes the people he meets as either predators or victims, a byproduct of his previous profession. When he needs to be, he is violent with no hesitation, doing what he must in the moment. But there is something decent about him all the same. He may not be your typical good guy but he is also not a douche. For whatever reason and despite his past, he still tries to do the right responsible thing. He is not swayed by emotions but that doesn’t mean he is unfeeling. Unlike Annalise, he is aware of the cost and tries to avoid collateral damage when he can, knowing that sometimes it is unavoidable. As for Annalise…… I. Love. Her. Holy crap, do I love her. She is tough, brutally hard, heartless even, and incredibly powerful – magically as well as physically. In fact, she may not even be human. She is a force to be reckoned with. In her uncompromising view, there are only predators and collateral damage. She will do whatever she must to destroy those misusing magic. The needs of the many outweigh the few. She also has a real hard-on for Ray, for reasons hinted at but never fully explained. Suffice to say, she blames Ray for the death of her friend, although it is unclear if he is truly responsible. Fortunately for Ray, their mutual bosses, the Twenty Palaces Society, have forbidden Annalise to kill him. Unfortunately, part of his job is to act as Annalise’s “wooden man”, which means he's the cannon fodder that draws attention away from Annalise and enables her to launch sneak attacks. So he could still die at any time. There is a lot we don’t know. We don’t know what the Twenty Palaces Society is beyond that it is their mission to eradicate the monsters who prey on humans. We have a vague idea of what Ray did that brought him to the society’s attention and earned him Annalise’s hatred. But none of it matters because Connolly writes skillfully enough that we understand who these characters are, even if we don’t know the specifics of why they are the way they are. And it is all written in a clear, clean manner, with hints that tantalize but never confuse. My only quibble - and really this was minor - was the abrupt ending. It was really abrupt. I would have like to have seen a little more of the aftermath. I cared about these characters and I wanted to see at least some of the fallout. You can probably tell that I really liked this book. The voices of the characters are clear and believable and the plot moves swiftly, with not a moment wasted. I can't wait to read the next book in the series and have only been puttting it off because my TBR pile is so crazy-assed large, I feel like I can't buy another book until I at least make a dent in it. In the meantime, Child of Fire is going on my keeper shelf.